On Saturday, September 23, Downtown Los Angeles’ Corey Helford Gallery (CHG) will premiere the long awaited new solo exhibition from world-renowned multimedia street artist D*Face, entitled “Happy Never Ending”. As one of the most prolific contemporary urban artists of his generation, D*Face (a.k.a. Dean Stockton) has been at the forefront of his practice since his initial breakthrough in 2005. 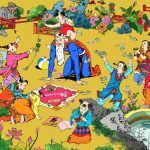 Working with a variety of mediums and techniques, he uses a family of dysfunctional characters to satirize and hold to ransom all that falls into their grasp – a welcome jolt of subversion in today’s media-saturated environment. His ambition is to encourage the public eye not just to “see” but to carefully consider the surroundings of our day-to-day, and society’s increasingly bizarre fascination with celebrity culture and mass consumerism. By rethinking, editing and subverting imagery drawn from decades of materialistic consumption – currency, advertising and comic books, D*Face transforms these now iconic motifs, figures and genres in order to gain new insight into today’s conspicuous society. Describing his work as aPOPcalyptic, D*Face seeks to pick up where the masters of 80s American Pop left off – to establish a very real, albeit tongue and cheek criticism of our consumer dominated world. “With this new series of work I wanted to re-kindle the lost romance of a bygone era, back when, even in death, the memory of a loved one could last an eternity and a marriage went beyond just a symbolic gesture. For the show I want to construct a mini chapel where we can actually hold a real ceremony and a graveyard in which I want people to leave momentos to the people they have lost. If romance is truly dead, then I want to resurrect it for the modern age. 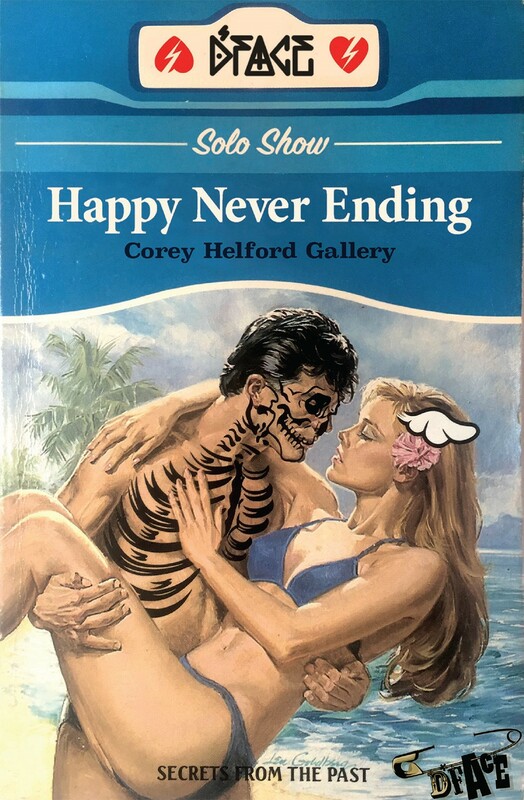 The opening reception for “Happy Never Ending” will be hosted Saturday, September 23 from 7-11pm in Gallery 1 at Corey Helford Gallery. The reception is open to the public and on view through October 21. 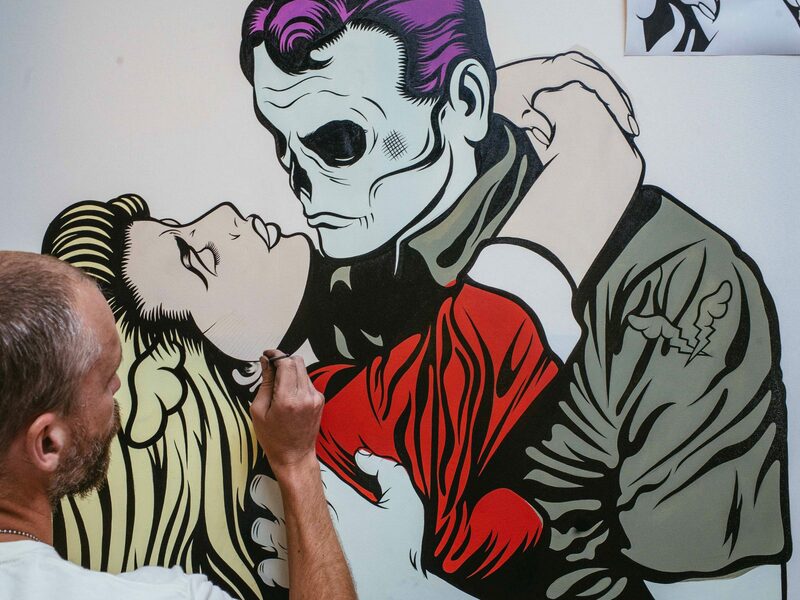 As one of the UK’s most prolific street artists, D*Face (Dean Stockton) has been at the forefront of his practice since his initial breakthrough in 2005. Having grown up amidst the streets of London, he cultivated a keen interest in graffiti art and its disaffected mindset from an early age. As a teenager, his artistic attentions turned to skate culture and the iconic skate deck designs of Jim Philips and Vernon Courtlandt Johnson that he found in Thrasher Magazine. Inspired by their punk DIY aesthetic, D*Face attended an illustration and design course before beginning work as a freelance artist. 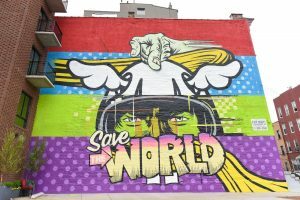 Taking the public domain of the street as his canvas, he blended art, design and graffiti in a manner that pre-dated the emergence of street art as it is known today. Here the artist gained a great deal of attention, quickly rising to fame for the vivid nature of his designs. 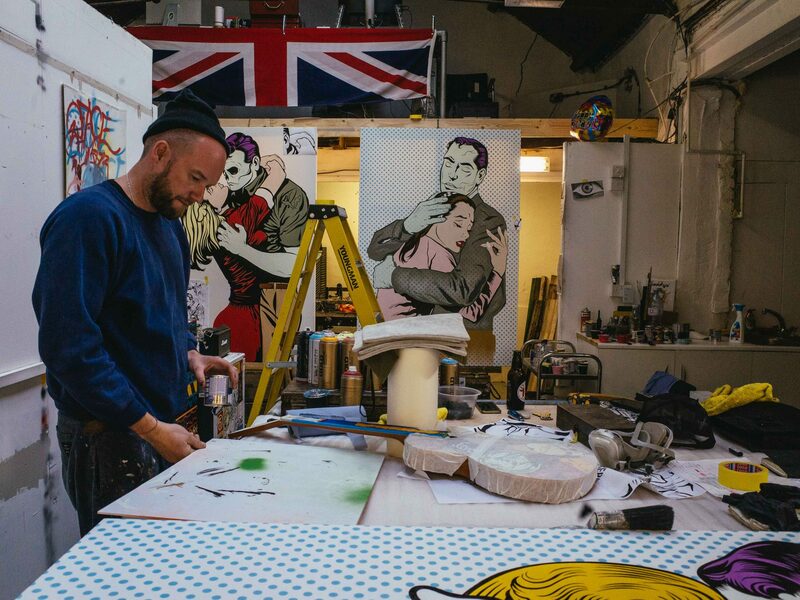 Despite now working in the gallery as well as the open canvas of the streets, D*Face continues to approach his work with the same anarchic energy that drove him to begin his career from the outset. His vibrant pop style and D*Dog logo have become synonymous with British street style and are recognized the world-over. Alongside having worked with the likes of Shepard Fairey and Banksy, D*Face has also collaborated with Her Royal Highness Queen Elizabeth II on a project that involved the customization of banknotes and coins and their secret reinsertion back into public circulation. In 2005 the artist was also commissioned by the Vatican to produce a portrait in commemoration of Pope Benedict XVI’s instatement. The piece was shown for the first time at the Outside Institute in May 2005, as well as on MTV Rome to great critical acclaim. In recent years D*Face continues to work closely with cultural icons, having designed the latest album artwork for the internationally renowned punk band, Blink-182, a record which sold over five hundred thousand copies worldwide and reached number one in over fifty countries. 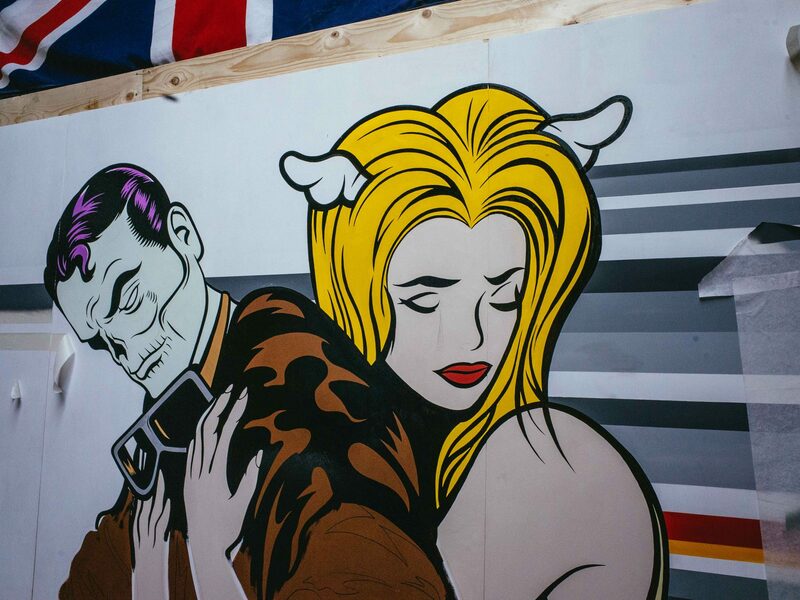 On top of solo exhibitions, global mural commissions and a host of secret projects, D*Face also runs his own London gallery, StolenSpace, which hosts numerous sell out street art exhibitions on an annual basis. In more recent years he has also begun a new venture into motorbike design with his Rebels Alliance Motorcycle Company, similarly based in London’s east end. With so much in the works, it’s hard to say what’s next in store for one of the UK’s most eminent street artists. 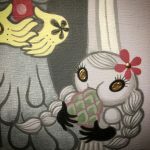 This entry was posted in Art Stuff Los Angeles and tagged Corey Helford Gallery, DFACE. Bookmark the permalink.